popular with those who didn't want the bother of choosing their own veneers and designs. 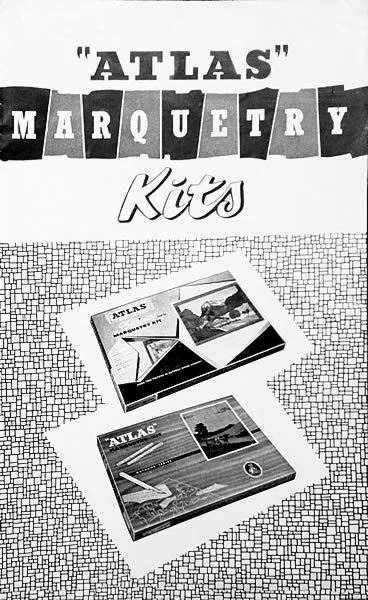 This modern series of six Atlas marquetry kits will be welcomed by the enthusiastic marquetry worker, who will find in these designs plenty of scope for the exercise of his skill. The pictures owe their freshness not only to the choice of subject, but also to the interesting choice of the veneers. A large coloured picture on the box serves as a guide in working, and each kit contains printed baseboard, design, numbered and spare veneers, full individual instructions and the necessary materials to complete the picture. 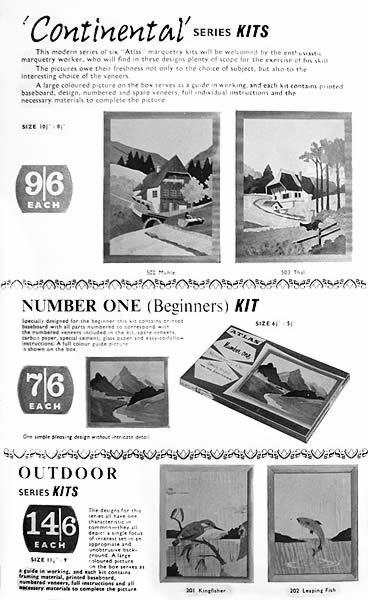 Specially designed for the beginner this kit contains printed baseboard with all parts numbered to correspond with the numbered veneers included in the kit, spare veneers, carbon paper, special cement, glass paper and easy-to-follow instructions. A full colour guide picture is shown on the box. The designs for this series all have on characteristic in common—they all depict a single focus of interest set in an appropriate and unobtrusive background. 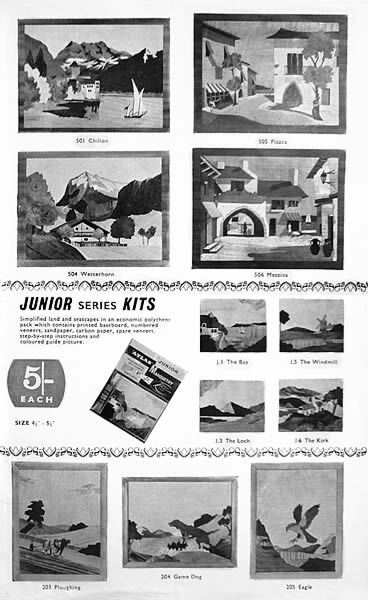 A large coloured picture on the box serves as a guide in working, and each kit contains framing material, printed baseboard, numbered veneers, full instructions and all necessary materials to complete the picture. Simplified land and seascapes in an economic polythene pack which contains printed baseboard, numbered veneers, sandpaper, carbon paper, spare veneers, step-by-step instructions and coloured guide picture. It is the nature of marquetry itself which accounts for the popularity of the craft; sheer interest In the colour, grain, markings and texture of the various veneers, appreciation of how these characteristics may be used in the composition of a picture, and the satisfaction of skilled workmanship. The only additional requirement to these kits is a Manchester Craft Knife for the satisfactory cutting of the veneers. 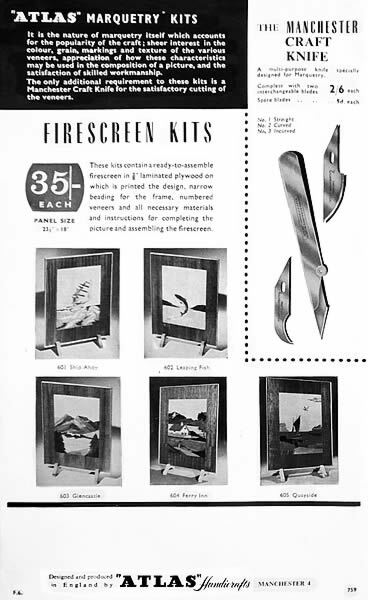 These kits contain a ready to assemble firescreen in a laminated plywood on which is printed the design, narrow beading for the frame, numbered veneers and all necessary materials and instructions for completing the picture and assembling the firescreen.